I remember Richardson’s Yard well from the days that it was under the control of Mr Richardson, the well-known local scrap metal dealer whose firm, G. E. Richardson & Sons, is still thriving in the adjoining industrial unit. The yard was previously home to huge containers for scrap iron and steel, beside which heavy sash window weights were placed which Mr Richardson bought for £1 apiece. Richardson’s Yard has been cleared and prepared for the arrival of 36 shipping containers. 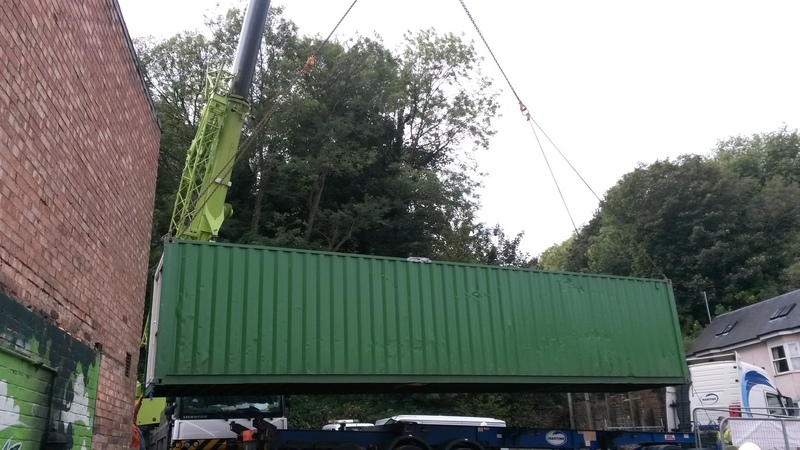 After years of travel around the world, potentially by ship, lorry and train, each 40ft container has been converted into a new home in an exciting new project by BHT and QED Estates. 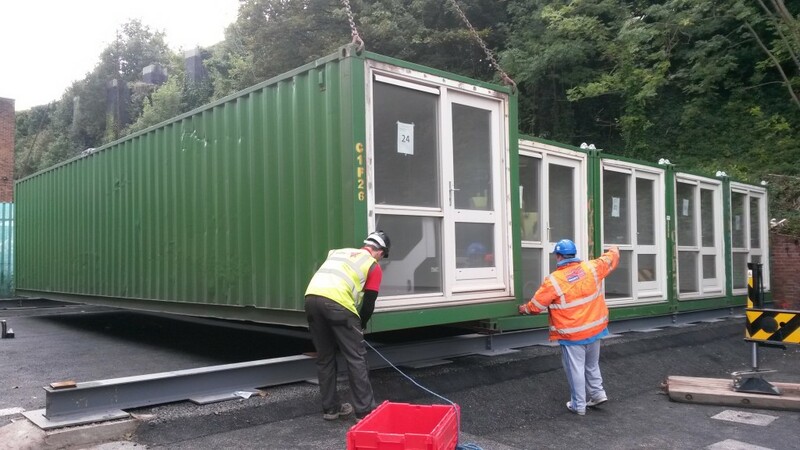 I was invited by Andy Winter from BHT for the arrival of the first batch of containers. The first thing that I noticed about the site, just up from Preston Circus in Brighton, was the remains of the Cobbler’s Thumb pub. The pub was owned by Brighton & Hove City Council apparently, and demolished for structural reasons. Whatever the reason, its empty site is now a great place to store a workmen’s portacabin. Ross Gilbert from QED told me that the shipping containers are all coming to Brighton via the Tilbury Docks. 30 will be located at the rear of the site over five storeys with six per storey. On the right-hand side, six units will be arranged across three storeys with two per storey. Containers above ground level will need balconies and steps. A contractor called REDS10 will be carrying out much of the work. I have nothing but respect for the drivers of the lorries who have been reversing into Richardson’s Yard, and the crane operators who then have to lift the units into place. Planning permission for the scheme, which was granted in April, is of a temporary nature and has been limited to five years. If the reception is anything like that of the popular Keetwonen development in Amsterdam, this will no doubt be extended. Keetwonen consists of over 1,000 units and has been an absolute hit with students. When I left site, there was still much to be done. 31 containers were still to arrive. Once fixed together, services will be installed and a green roof added. The work of local graffiti artist Paul Barlow will grace the top two storeys, which are high enough to be seen from some distance away. 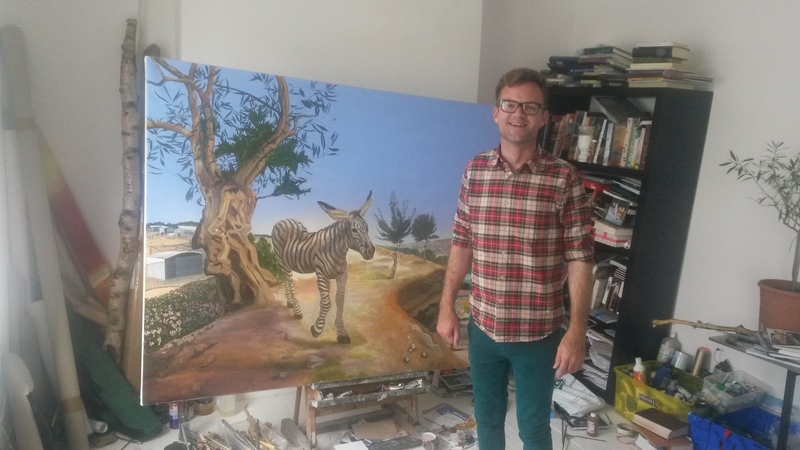 Sillwood Road resident Shan Lancaster was overjoyed when her new neighbour, Peter Harrup, joined her search to properly identify John Constable’s Brighton home. Something like 200 of Constable’s works of art were created during the time that he spent in Brighton with his family in 1824-8. One painting that particularly stands out is that of the Chain Pier behind a bustling beach and choppy sea. He was known to have lived at 9 Sober’s Gardens from letters that he wrote during his stay in what was by then a thriving resort. Sober’s Gardens was also known as Western Cottages and was renamed Sillwood Road during the 1870s. Key to the story is a painting from 1824 by John Constable that shows nearby Western Terrace and Gothic House alongside Western Lodge from a viewpoint that no longer exists. Western Lodge features what appears to be a balconied terrace above a colonnade and pedimented porch. It was built in around 1817 to the designs of famous local architect Amon Henry Wilds and later demolished. 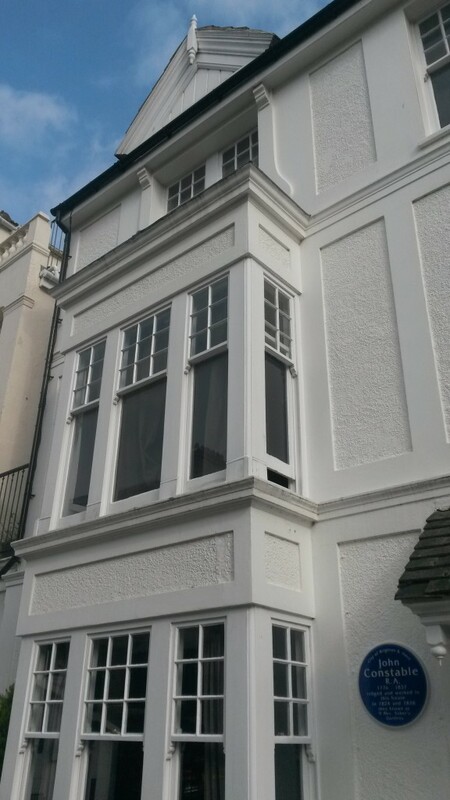 Wilds also designed Western Terrace, and Charles Augustin Busby designed Gothic House. 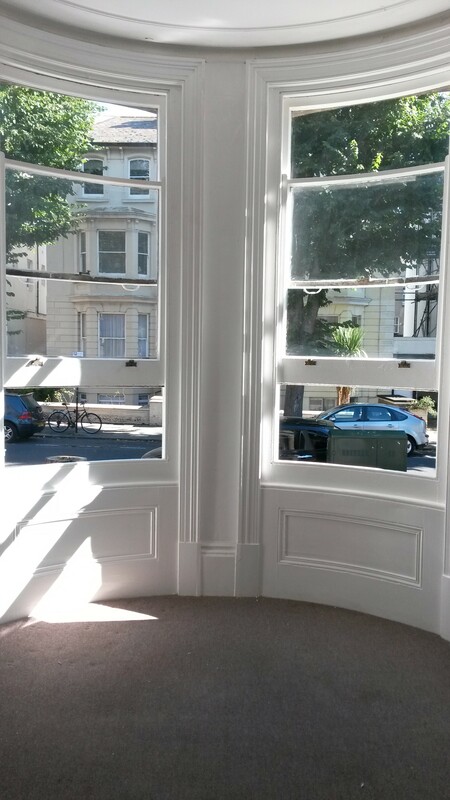 It was Wilds and Busby who designed Kemp Town for developer Thomas Kemp. Kemp’s sister was Mrs Ann Sober and it was on the gardens of her house, Western Lodge, that Sillwood Road was built. 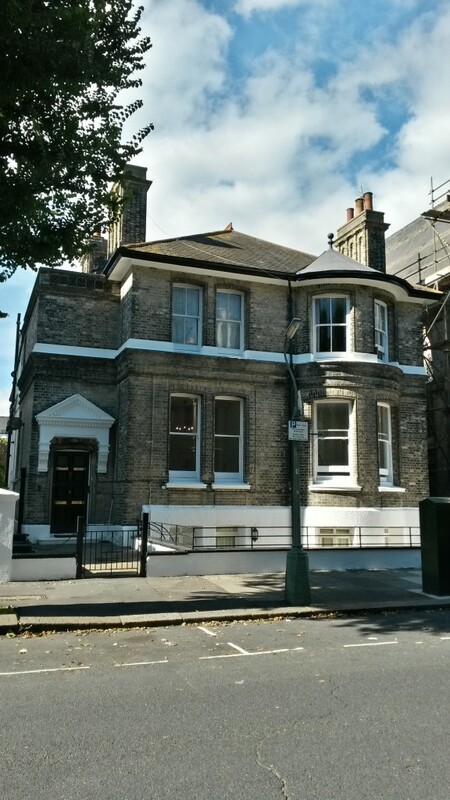 As the western side was built after Constable lived in Brighton, he was able to paint Western Terrace and Gothic House from his home studio on the east side with uninterrupted views. The mystery of Constable’s home was solved when it was firmly established by Shan that an artist called John James Masquerier lived at what is now 10 Sillwood Road. Masquerier was a famous painter at that time and known to be Constable’s next-door neighbour. This confirmed that Peter’s home, 11 Sillwood Road, was the home of John Constable. As an artist himself, who uses what was no doubt Constable’s own top floor studio, Peter was thrilled. 11 Sillwood Road has changed much since it was built in the early 1820s. The three-storey semi-detached house, along with its adjoined neighbour, were extensively modified in the 1860s when the roof was raised, gables added, alleys built over, and Tudor-esque facades introduced. To celebrate Constable’s time at 11 Sillwood Road, a blue plaque has been installed. It was unveiled in July by artist Richard Constable – the great-great-grandson of the great man himself. Dr Richard Russell transformed Brighton by famously promoting the health benefits of seawater. His own home, Russell House, was conveniently built right by the sea in 1753. Images of Brighton seafront from the mid-1700s show the house on the edge of a cliff, just above the water. The Royal Albion Hotel was built on the site in 1826 to the designs of prolific local architect Amon Henry Wilds after Russell House was demolished in 1823. Yet we all know that the Royal Albion is separated from the sea by a wide road and broad pavements. And a generous colonnade and ramps. And the shingle of the beach itself. It is not the case that poetic licence has been shown by artists of olde. The topography of the town has in fact changed. The Brighton of today does still sit on the top of a 40ft-high cliff but this cliff is now hidden away from view. In effect, the beach has grown upwards whilst the land has extended outwards. The first wooden groynes were built in Brighton in 1723-4 but these were insubstantial. The first concrete groyne was constructed at the bottom of East Street in 1876 and the second, the Albion Groyne (originally called the Aquarium Promenade Groyne), was added in 1876. 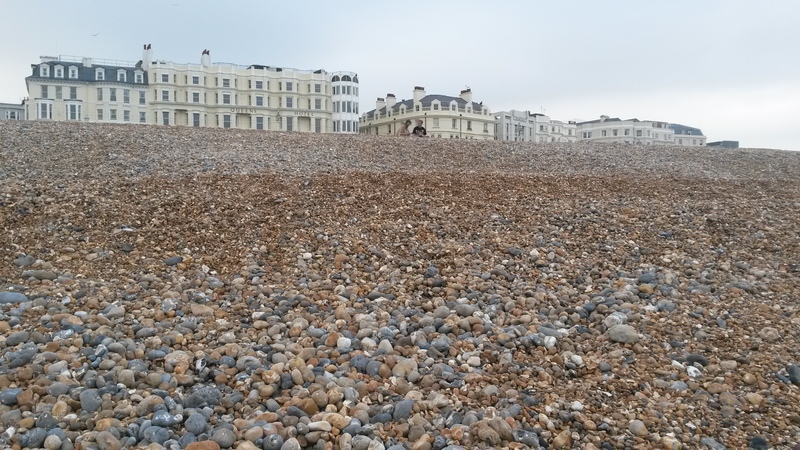 These led to the build-up of the shingle beach. King’s Road was built in 1821-2 to replace a cliff-top track. Its construction was actually supervised by Amon Henry Wilds. The various stages of the road’s construction can easily be seen today in the brickwork within some of Brighton’s many seafront arches. It was widened during the 1850s and 1860s. When it was widened again during the 1880s, the extensive works included the construction of the huge shelter beneath the promenade at the bottom of West Street which was, until recently, Riptide Gym. Land was essentially being claimed from the sea. Looking further back, the opposite happened. 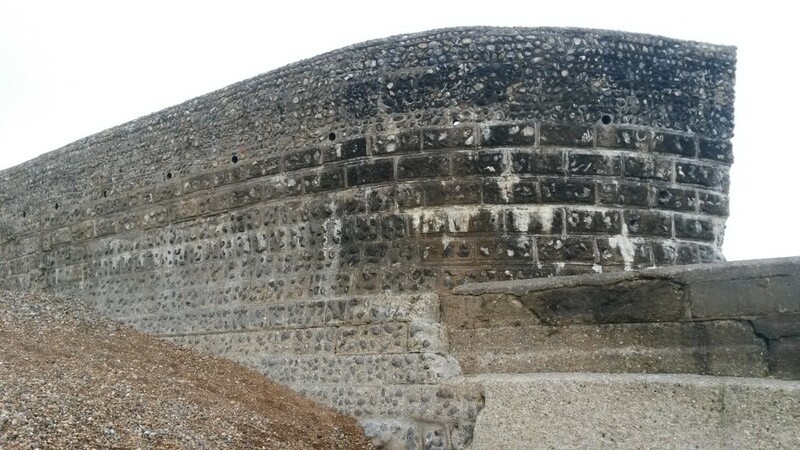 The Brighton of 1086, as recorded in the Domesday Book, is thought to have existed below the cliff but this so-called ‘Lower Town’ was shrinking. 40 acres are said to have been lost to the sea from 1290 to 1340. The Lower Town was burnt by the French in 1514 and then finished off by the great storms of 1703 and 1705. It is not surprising that Brighton’s fishermen thought that a move to the cliff-top would be a far safer bet.